We will release a poster a day this week, totally free for you to print. Most of the images will also work in monochrome if you don't have access to a color printer. These images are around A3 sized but can be printed a bit larger or smaller if you like. If you can only print on A4, here are some directions on how to print on two sheets of A4 paper to make an A3 image, with some assembly required. Last week we experienced some 'technical difficulties' as the Internet was out for ninedays. Rest assured, we maintained our pro-reasonable demeanor with the ISP (rhymes with "Blue,") while convincing them that it was indeed broken and it was not going to fix itself. Now that we've rejoined the 21st Century, we will be adding more content this week. 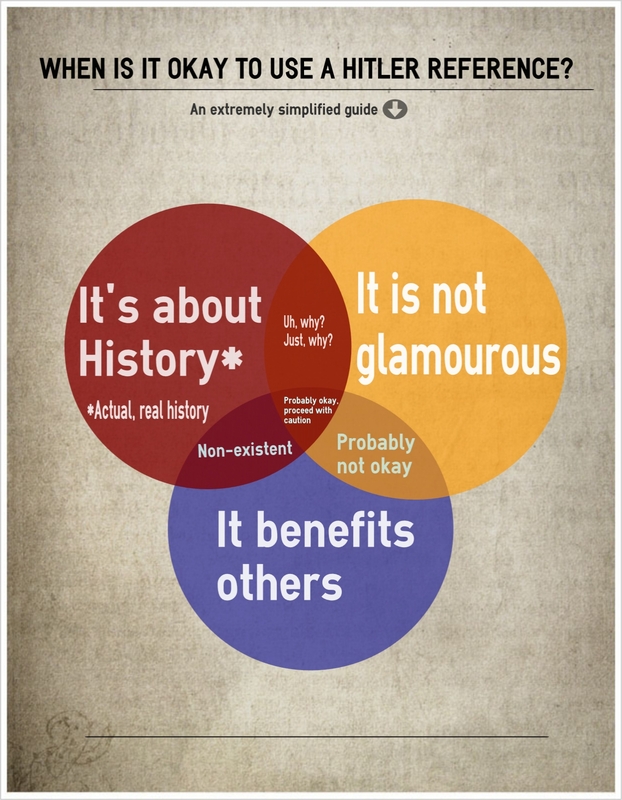 We are creating posters for teachers and History buffs that are downloadable and printable in large formats. Themes for the posters will be encouraging people to study History, multi-culturalism in a global context and reasonableness. We love suggestions, so feel to make a request. Sneak previews have been posted on our Facebook, Twitter, Tumblr and Pintrest so consider liking and following us on those platforms- links are at the top of the page. Check It Out, New Video! Our first video! You may have noticed that we often use a light-hearted tone when discussing these issues. Of course, we are trying to teach people to understand that making reference to the Holocaust, Hitler and Nazis is actually something to take very seriously. We're working on other projects that are more serious, but it seems that too much seriousness can make people tune out. It's a delicate balance. We hope to produce more videos and get people talking and thinking. Talking about the issues of bigotry, homophobia and radical nationalism can be a bit awkward, but it's really important that you do. Everyone can benefit from honestly listening to the points of view of others. One of our core values is to educate and facilitate discussion regardless of educational level. Sure, we can put on our structural anthropological semiology fancy-pants (too many disciplines there to be a mere hat) but that defeats our purpose. We can if we have to. Besides, most of the people that are actively opposed to our mission really wouldn't get that stuff anyway.